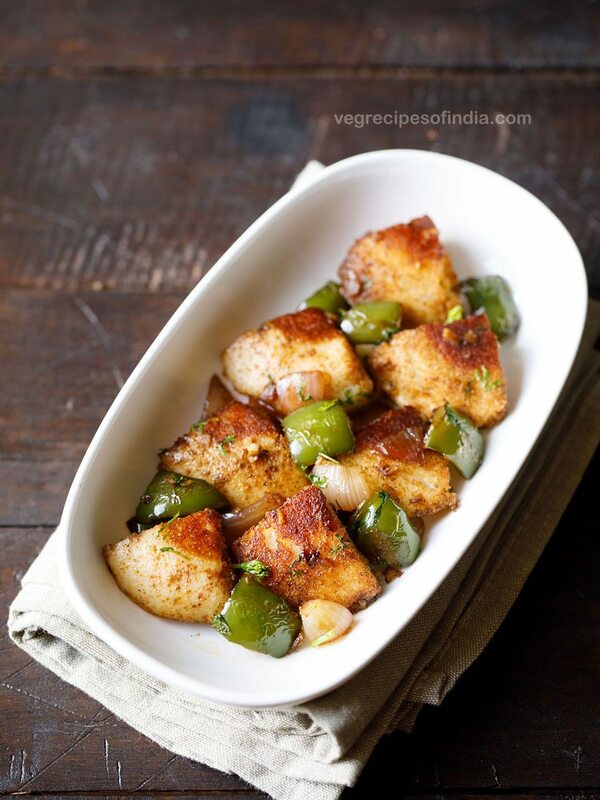 idli manchurian recipe is a delicious way to use leftover idlis. it is spicy and lightly sweet and sour in taste. 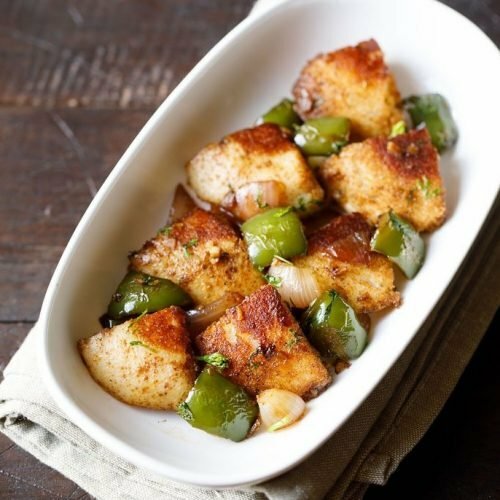 this indo chinese snack of idli manchurian is a fusion dish. 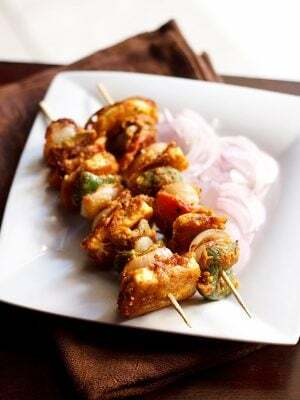 idli manchurian recipe with step by step photos – idli manchurian is a delicious way to use leftover idlis. this indo chinese snack which is a fusion dish is spicy and lightly sweet and sour. to make idli manchurian you can use medium or large sized idlis or mini idlis. making idli manchurian is quick and the recipe gets done in 20 to 25 minutes. 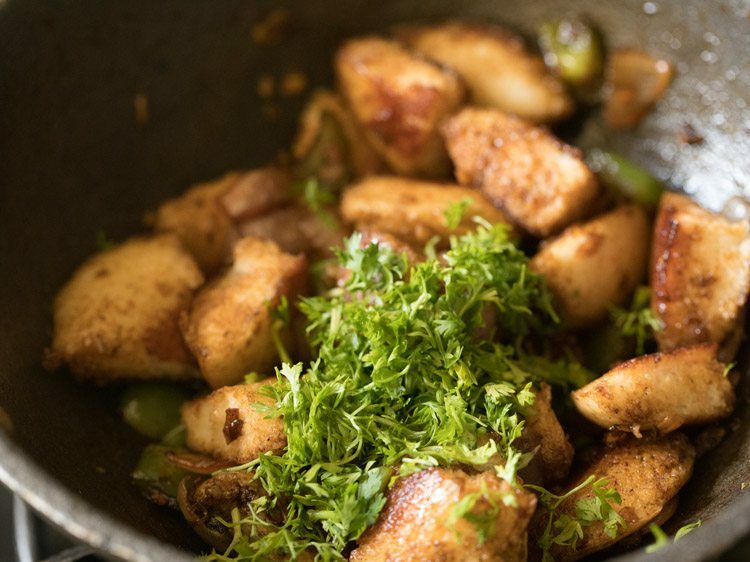 in the recipe, i have pan fried the idlis and later chopped them. if you want you can chop them first and then fry them. 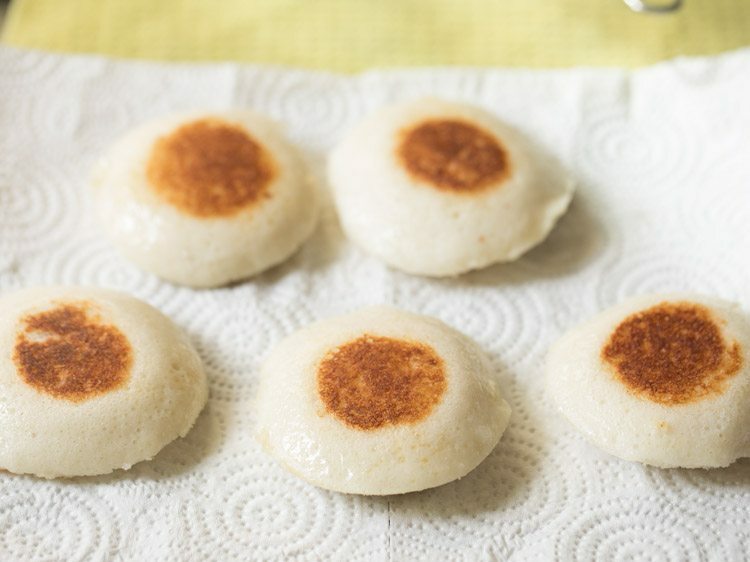 alternatively you can deep fry or shallow fry idlis. this recipe can be easily halved or doubled. you can serve idli manchurian as snack or as a starter also. heat 2 tablespoons oil in a shallow frying pan or a tawa. keep the flame to medium-low and place the idlis. 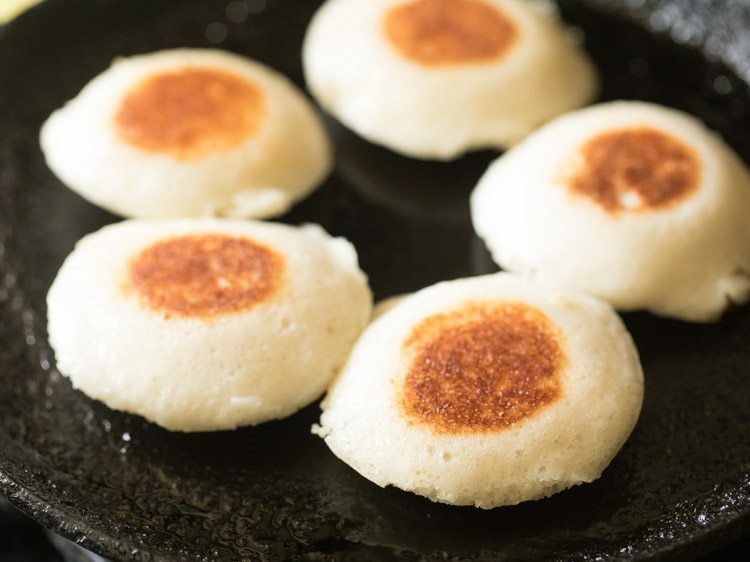 when one side is crisp and golden, turn over the idlis and fry the second side. 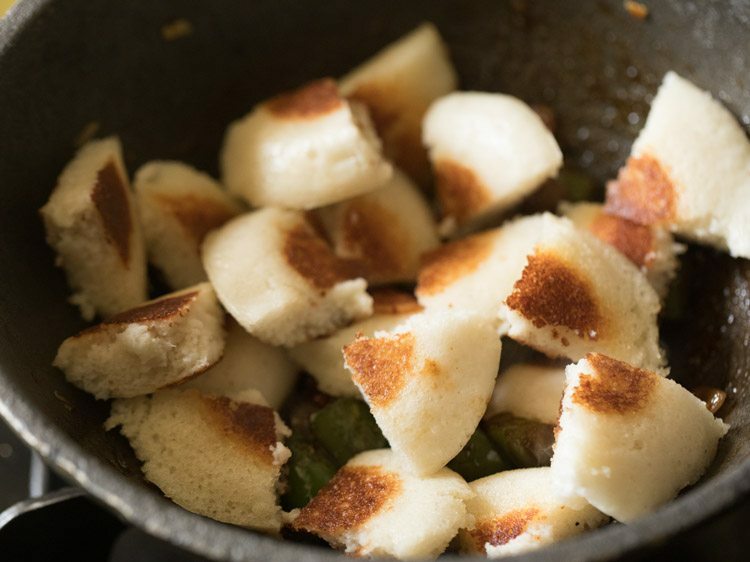 fry the second side of the idlis also till they turn crisp and golden. 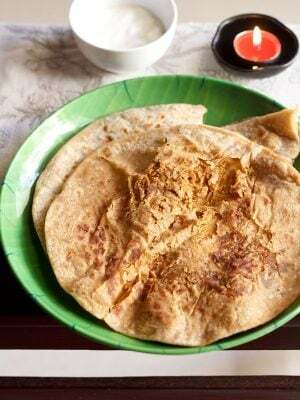 remove the pan fried idlis on kitchen paper towels. let them cool a bit. when the idlis are slightly hot, then chop them in four parts. keep aside. 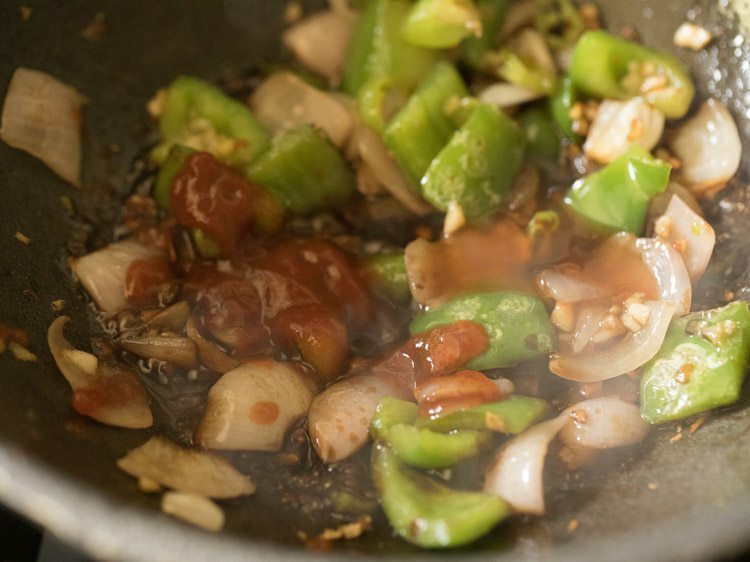 heat 1 tablespoon oil in a pan or wok. 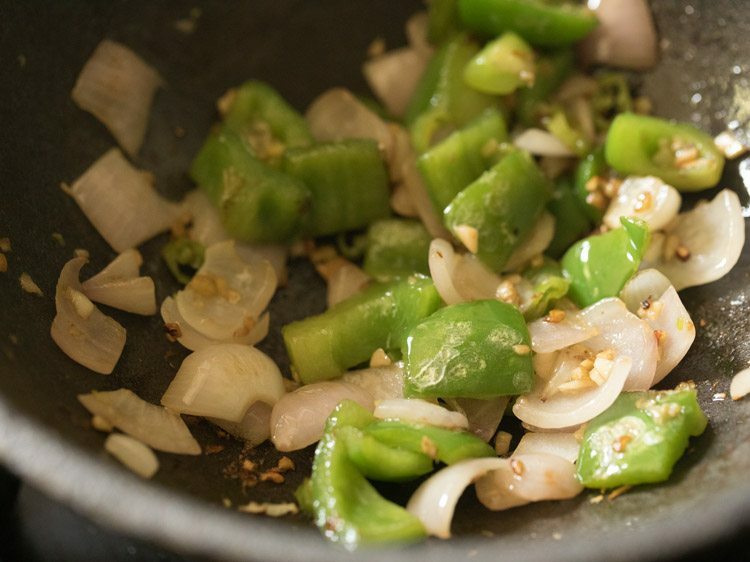 add finely chopped garlic, finely chopped ginger and green chilli (finely chopped). sauté on low flame till the garlic starts turning light golden. then add the chopped onions and capsicum. 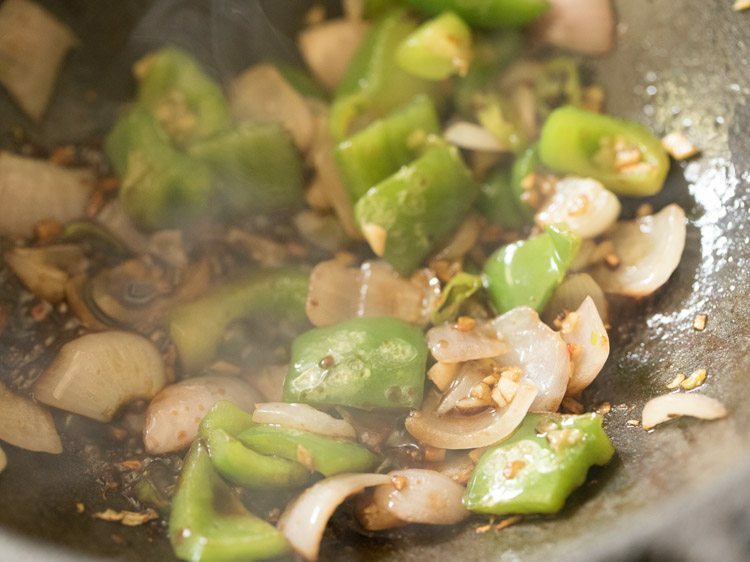 mix and begin to sauté onions and capsicum on a medium-low to medium flame stirring often. 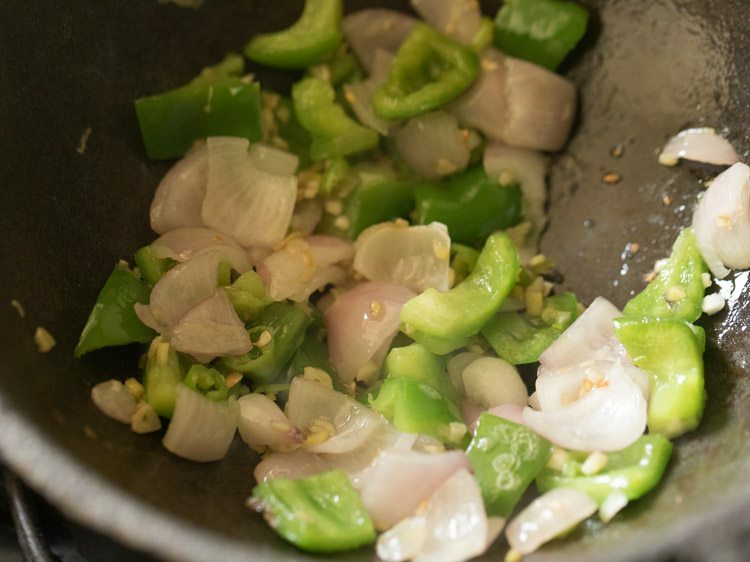 sauté till to you see the edges of both the onion and capsicum lightly golden with some blisters on them. keep the flame to a low and then add 1 tablespoon soy sauce (naturally fermented). immediately add ½ tablespoon red chilli sauce or sriracha sauce. then add ½ tablespoon sweet red chilli sauce or tomato ketchup. mix very well. 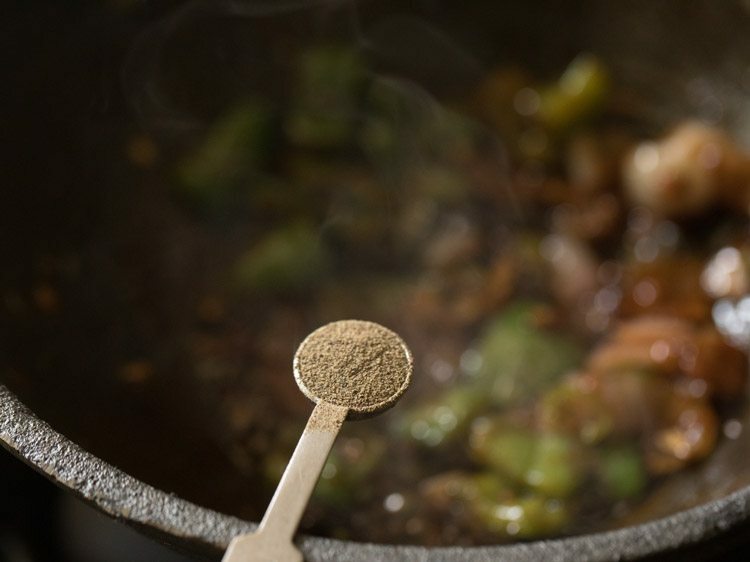 then add ¼ teaspoon black pepper powder. add salt as required and mix again. do add less salt as the sauces already have salt in them. mix very well. then add the pan fried idlis. 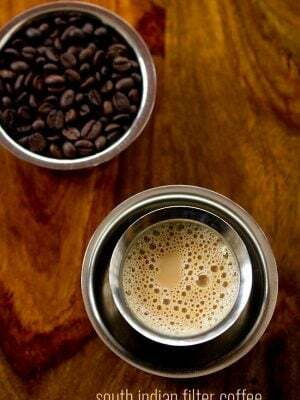 mix well so that the sauces coat the idlis. then switch off the flame. lastly add 1 to 2 tablespoons chopped coriander leaves. mix again. 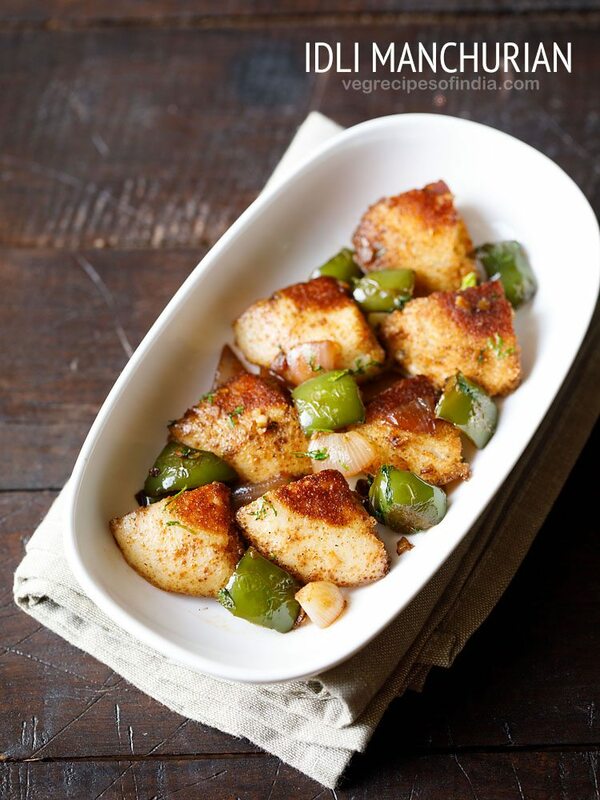 serve idli manchurian hot or warm as a snack. 1. first take the idlis. 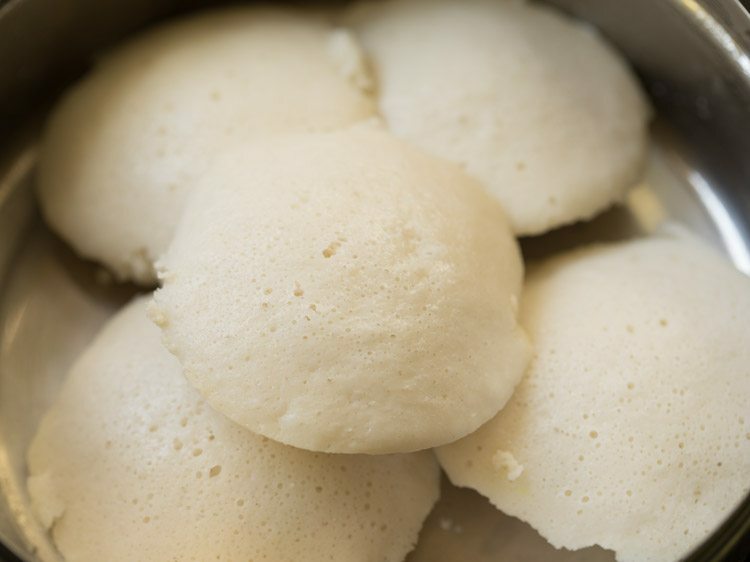 it is best if the idlis are refrigerated and then fried as they absorb less oil. 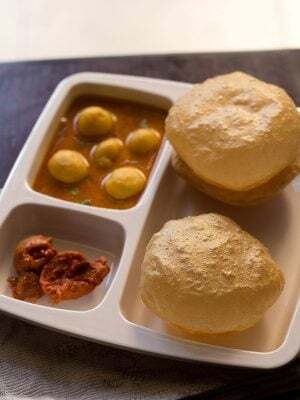 i have used 5 idlis. 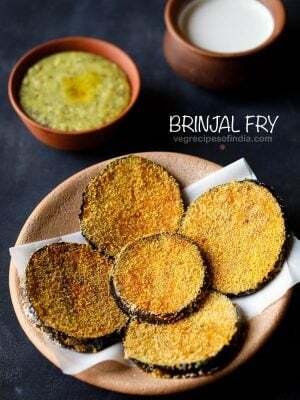 2. heat 2 tablespoons oil in a shallow frying pan or a tawa. keep the flame to medium-low and place the idlis. 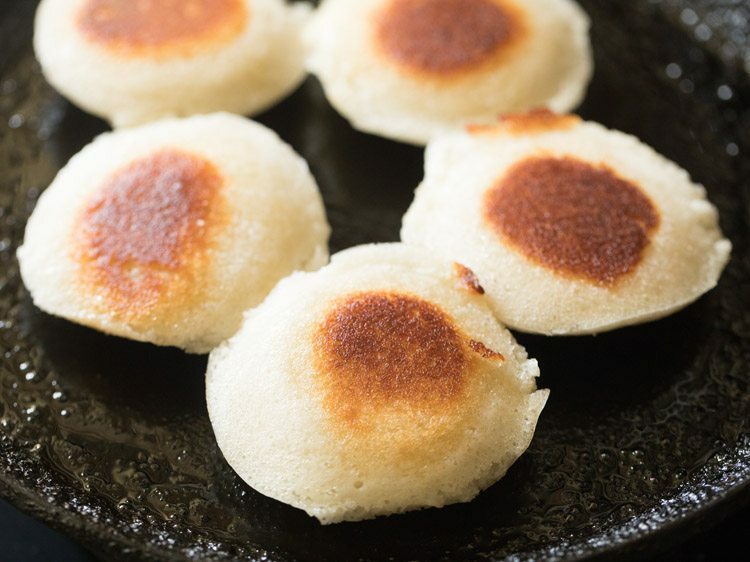 3. when one side is crisp and golden, turn over the idlis and fry the second side. 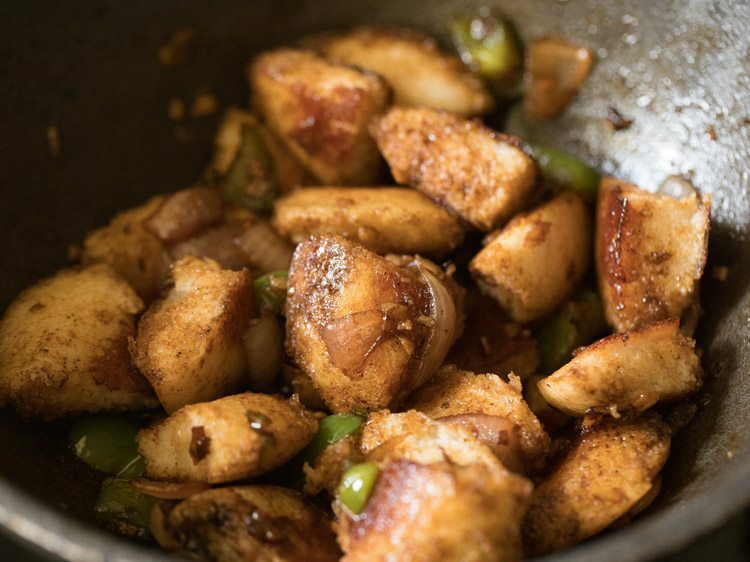 4. fry the second side of the idlis also till they turn crisp and golden. 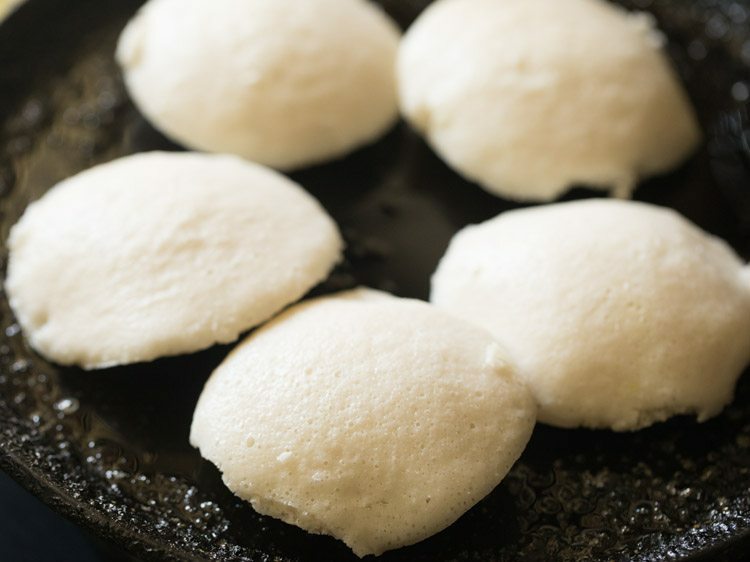 5. remove the pan fried idlis on kitchen paper towels. let them cool a bit. 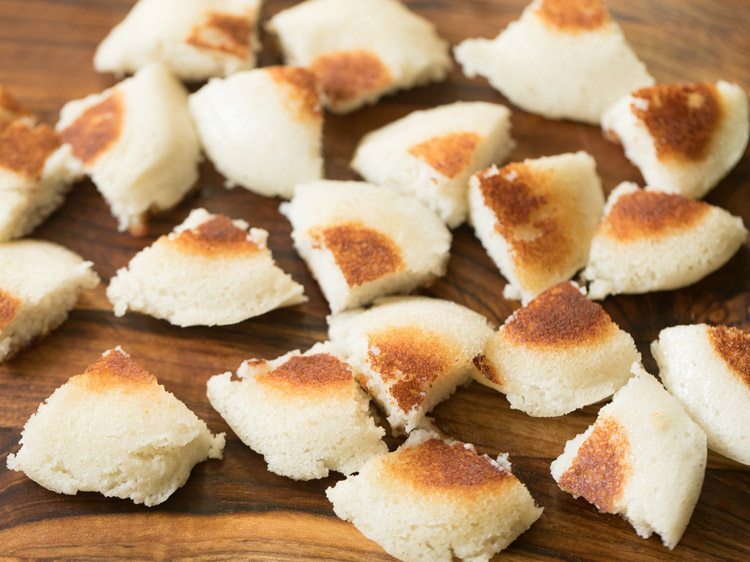 6. when the idlis are slightly hot, then chop them in four parts. keep aside. 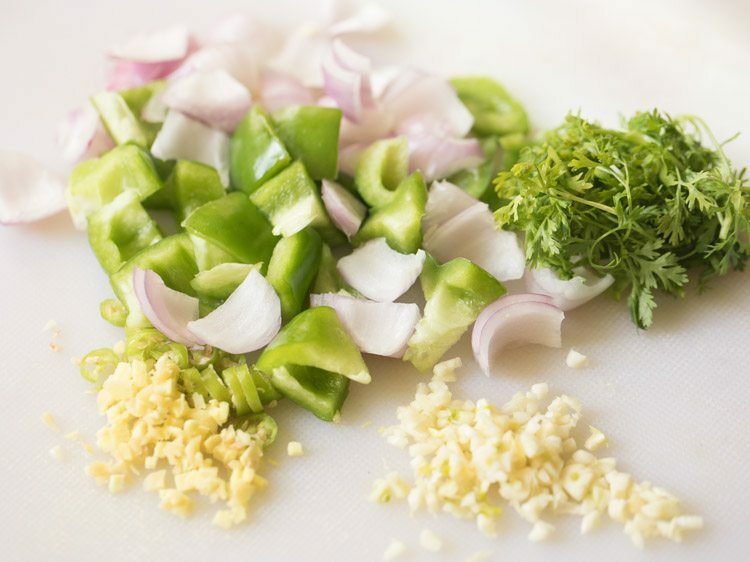 7. chop 1 medium onion and 1 small capsicum in small cubes or squares. 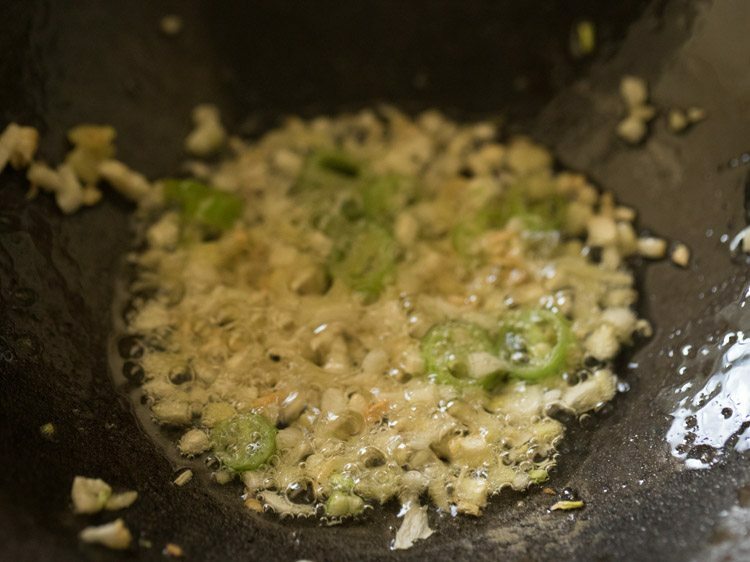 finely chop 6 to 7 medium garlic cloves, 1 inch ginger and 1 green chilli. 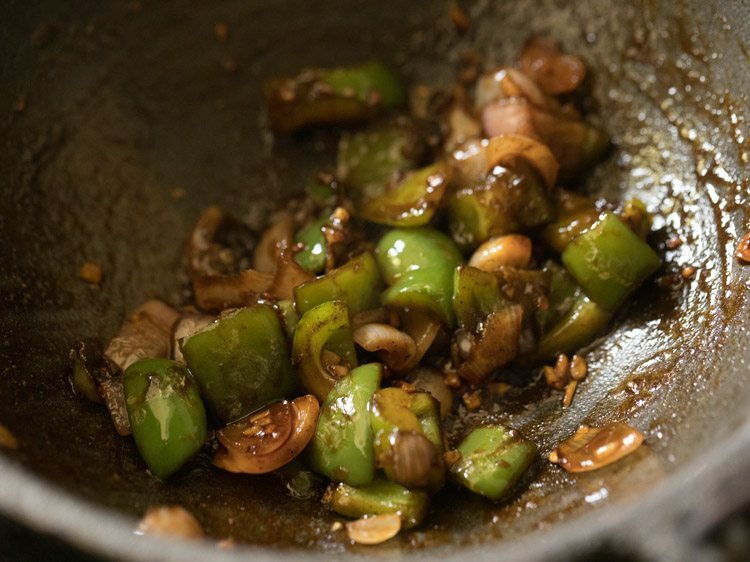 8. heat 1 tablespoon oil in a pan or wok. 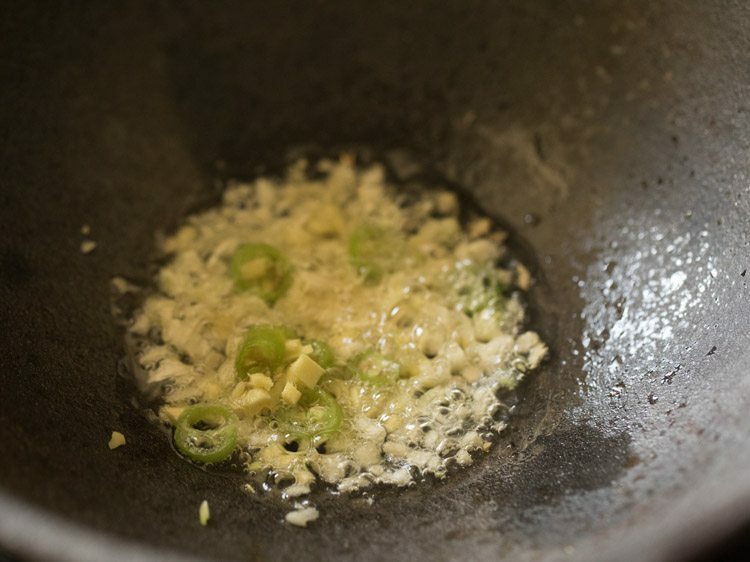 add the 1.5 teaspoon finely chopped garlic, 1 teaspoon finely chopped ginger and 1 green chilli (finely chopped). 9. sauté on low flame till the garlic start turning light golden. 10. then add the chopped onions and capsicum. 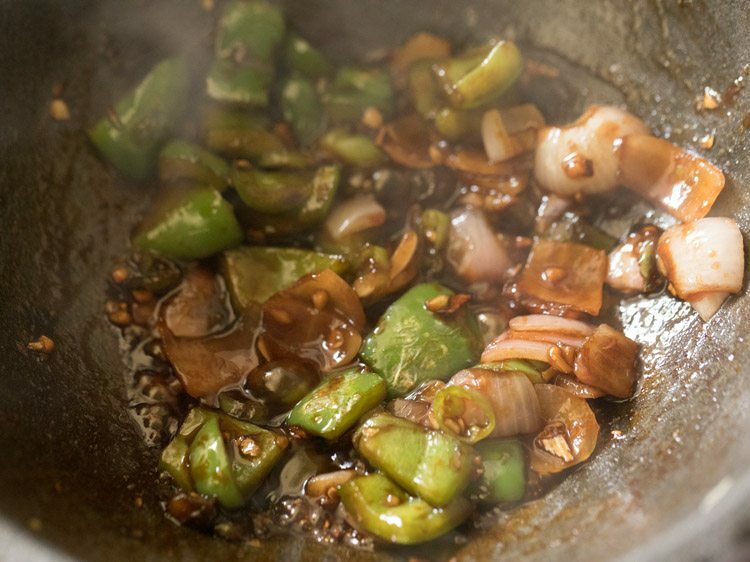 11. mix and begin to sauté onions and capsicum on a medium-low to medium flame stirring often. 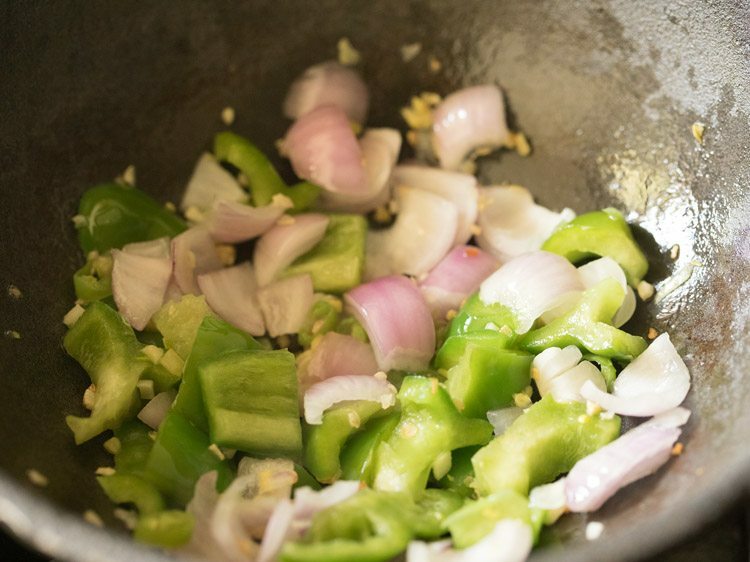 12. sauté till to you see the edges of both the onion and capsicum lightly golden with some blisters on them. 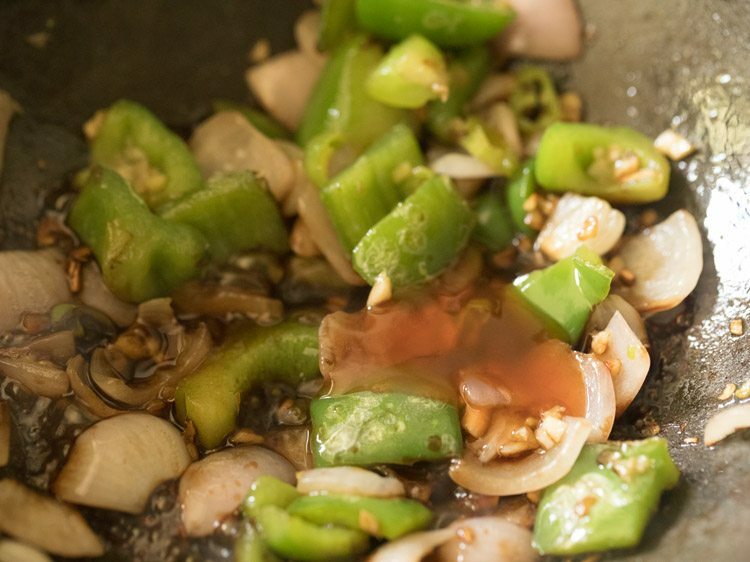 13. keep the flame to a low and then add 1 tablespoon soy sauce (naturally fermented). 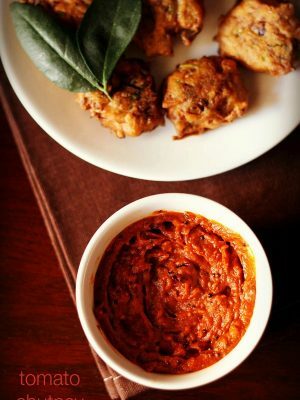 14. immediately add ½ tablespoon red chilli sauce or sriracha sauce. 15. then add ½ tablespoon sweet red chilli sauce or tomato ketchup. 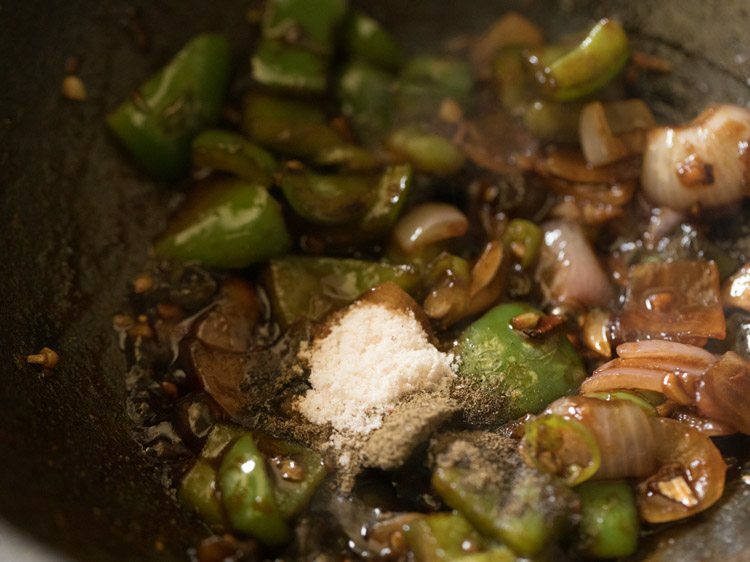 17. then add ¼ teaspoon black pepper powder. 18. add salt as required and mix again. do add less salt as the sauces already have salt in them. if you want you can also add a bit of sugar. i have not added as the sweet red chili sauce is already sweet. 20. then add the pan fried idlis. 21. mix well so that the sauces coat the idlis. then switch off the flame. 22. lastly add 1 to 2 tablespoons chopped coriander leaves. mix again. 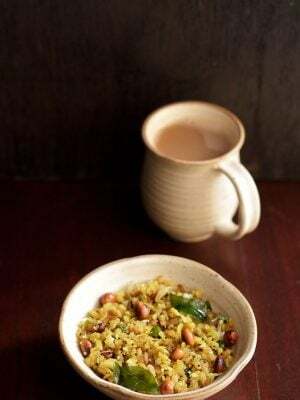 23. serve idli manchurian hot or warm as a snack.